If you have any questions or want to enquire about dates, use our form to contact Steven Hickling & Stephen Snead or see their website for more information. 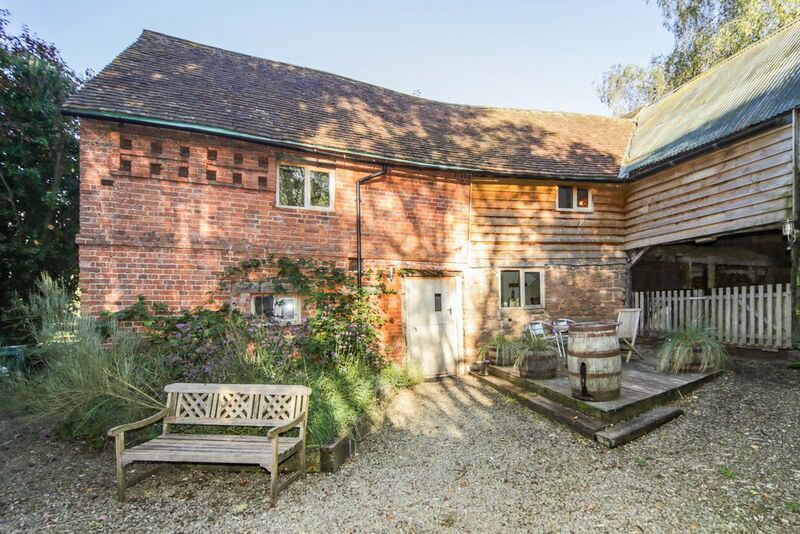 Down winding country lanes in the depths of the Welsh Marches, an Elizabethan farmhouse sitting in nine acres and surrounded by attractive barns. The Hop Pickers’ House was used by the hop workers, and it sits at right angles to an open barn. Step in to find an airy feel, open-plan upstairs and down, with white walls, old beams, wooden floors and a charming mix of pretty china, comfy chairs, throws and jugs of flowers. The kitchen area is cosy and rustic with a painted dresser, pine table for four and wood-burner (plenty of logs); you’ll find milk in the fridge, cake, jam and, of course, apple juice. Hop up painted stairs to a big four-poster with diaphanous drapes – be lulled to sleep by the hoot of an owl, the bleat of a lamb. Stroll through woodlands, wild flowers, fern gulley and orchards; rest by a babbling brook. In a distant corner with a view of the setting sun is a makeshift barbecue. The owners are in the farm next door through a rose-strewn pergola but you’ll feel very private. Lovers will purr with happiness here, walkers too, and cooks can stock up with food from famous Ludlow only 15 minutes away. A mouth-watering snug of a nest. Cosy blankets to snuggle up in, towels for drying off, dog bowls and poo bags provided. Lots of woodland walks and pretty brooks to explore with your pooch. 'Doggie' version of guest pack sharing dog-friendly places to eat, drink and walk. A very well appointed cottage for 2 and dog! Ruaridh (the dog) very well catered for with his own throw, towels and bowl. We loved the processco left to help us celebrate our anniversary. We were delayed arriving so Steven & Stephen took care of our food delivery which was very kind of them. Bed very comfortable but with me h having short legs I needed to literally climb into bed.....next time I'll bring a step! Garden is a dream for the dog with lots of room to run around in safety. We stayed here for a 2 night break for my husband's birthday. What a treat. Such a romantic place - tastefully decorated and impeccably clean. Lovely hosts Stephen and Steven. We were greeted with flowers, chocolates for my husband's birthday, home made produce and organic milk. Had a ramble around the grounds. Hope to visit in the summer and sit out among the stars. Would definitely recommend. What a magical place! A gorgeous, characterful property with a very romantic feel, in the middle of a picturesque part of the country. The property was spotless on arrival! We felt very at home here - it's a place you could easily spend a week. Beautiful grounds! The gardens are so well looked after yet still wonderfully wild and rugged, with some nice spots to sit with a book or drink. It was great to chat with Steven while he was in the garden, yet appreciated the privacy we had at the cottage. Nearby Tenbury Wells and Ludlow are great day trips. Would go back in a heartbeat! We had a lovely week at Hop Pickers House. It is truly beautiful accommodation in a beautiful part of the country. Very thoughtful welcome local produce taster was awaiting us. Great location, lots to see and do. A visit to the restored Art Deco Regal cinema in Tenbury Wells is a must. Would highly recommend staying at Hop Pickers. We hope to return at some point.....even in the winter, as it will be very cosy with the wood burner blazing! We stayed at the wonderful Hop Pickers' House for a long, relaxing and wonderful week. It was everything and more than we were expecting from a rustic and rural cottage in the lush green countryside of Worcestershire. The cottage achieved an incredible balance of being rustic and cosy - matching rocking chairs in front of a woodburner - whilst also being immaculately clean (I tried very hard to find a cob web but couldn't spot a single one!). Stephen and Steven were great hosts - both unobtrusive and incredibly helpful at the same time. Their great advice/ideas made my proposal fab!! Grateful! Beautiful place, immaculately presented - the owners have thought of everything and the house couldn't have been cosier or more welcoming. Really nice extra touches like blankets for the dog and local bread, jam and apple juice when you arrive made us feel really welcome. Lovely setting and Steven and Stephen couldn't have been more welcoming hosts - would thoroughly recommend! We're a stone's throw from Ludlow, described by Sir John Betjeman as “probably the loveliest town in England”. It boasts a majestic castle, stunning Georgian architecture, fantastic markets (almost every day) and exceptional places to eat. Enjoy the peace and seclusion of nearly nine acres of gardens, meadows, woodland and of course, the brook. Perfect for a stroll with the dog, listening to the birds, lying in the sun...or a beautiful place to just be. There are spectacular gardens in the area - Berrington Hall, Bryan's Ground and the walled garden at Croft Castle. Also, beautiful Stockton Bury. Or follow the Black & White Villages Trail, through some of England's prettiest villages.